Thanks to Amazon, we can now buy rare books from around the world. I was chatting a few days ago with Dave Jam about non-fiction books. I told him, â€œI heard reading books about fantasy before bed can help you get you into a dream state before sleepingâ€�. He said recommended me this book with a strange name called â€˜Kafka On The Shoreâ€™. Just got it in the mail... here in my lap! Life takes you in directions you never expected. On your journey you will face â€˜cuts from a thousand razor bladesâ€™. 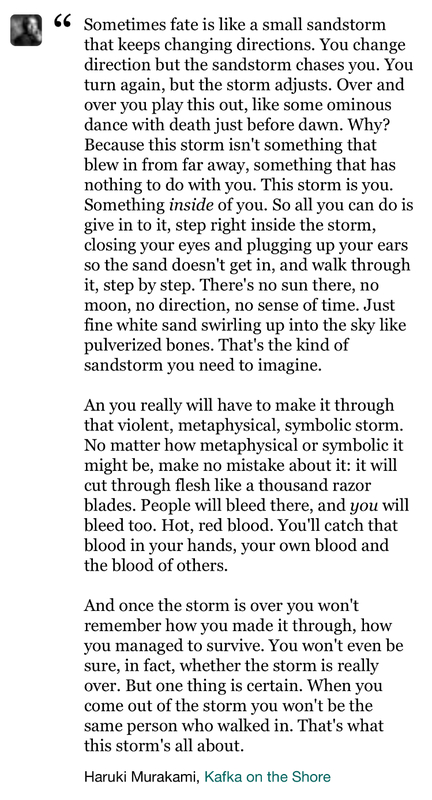 Itâ€™s built into the school of life...no matter what stage of life you are experiencing you wonâ€™t be able to tell if the storm ended... and therefore the thing that you can be 100% certain about is that you wonâ€™t be the same person at the end of the game..that is what life is about. Reminds me of a classic James Bond movie. #030: YOU ARE A MEME!